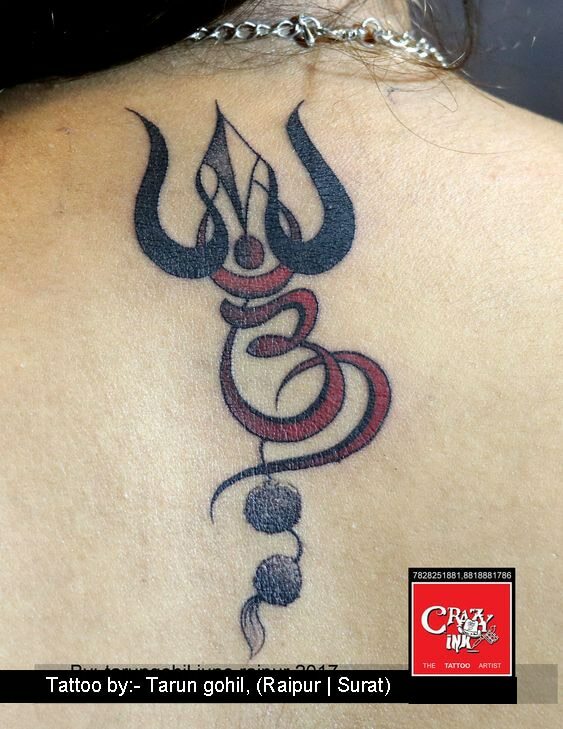 OM , TRISHUL & RUDHRAKSHA TATTOO. The Trishula has come to symbolize several important 'triads'. First, there is the Hindu trinity of deities - Brahma, Vishnu and Shiva. It also stands for the aspects and powers associated with these gods -- Creation, Preservation and Destruction. The three feminine (shakti) powers of will, action, and wisdom are also symbolized by the Trishula. TrishulaThree more symbols of the design are desire, will, and love. Not to be overlooked, are the the trishula design's potent symbolism of past, present and future. In Buddhism, the Trishula is symbolic of the Three Jewels - right knowledge, right belief, right action. In the Tibetan tradition, it is a magical weapon carried by the protective deities in their battles with evil forces. As a weapon it is also associated with the goddess, Durga, one of Shiva's many consorts. She brandishes it in one of her seven hands as she ferociously takes on enemy demons. A Hindu myth describes Shiva striking his son with the trishula, the power of the weapon so great that it sent the lad's head flying so far it could not be found. 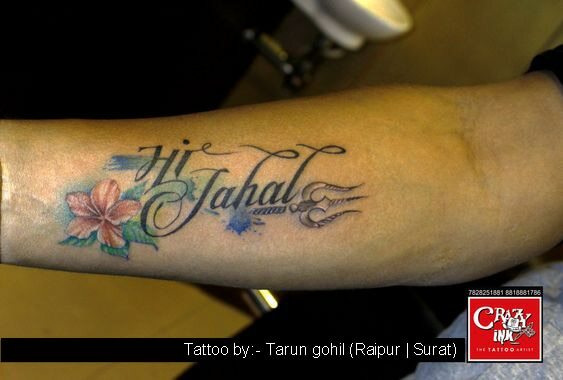 OM TATTOO, TRISHUL TATTOO, RUDHRAKSHA TATTOO, SHIVA TATTOO, MAHADEV TATTOO, MAHAKAAL TATTOO, CUSTOM SHIVA TATTOO, NECK TATTOO, TATTOO IDEA, SURAT TATTOO, SURAT TATTOO ARTIST, RAIPUR TATTOO, RAIPUR TATTOO STUDIO. THE ASIAN DRAGON TATTOO. The Asian dragon is one of the most popular mythological creatures picked for tattoo designs. They are a variety of different styles to chose from such as, winged and wingless, with snake-like features such as scales or cartoonist versions, with or without whiskers or horns. The dragon is believed to have the ability to multiply anything that it touches. They can be associated with the heavens or the sea. Japanese dragons are usually slender and wingless and have just three claws, while the Chinese or "celestial kingdom" types have five claws and beards of flames. 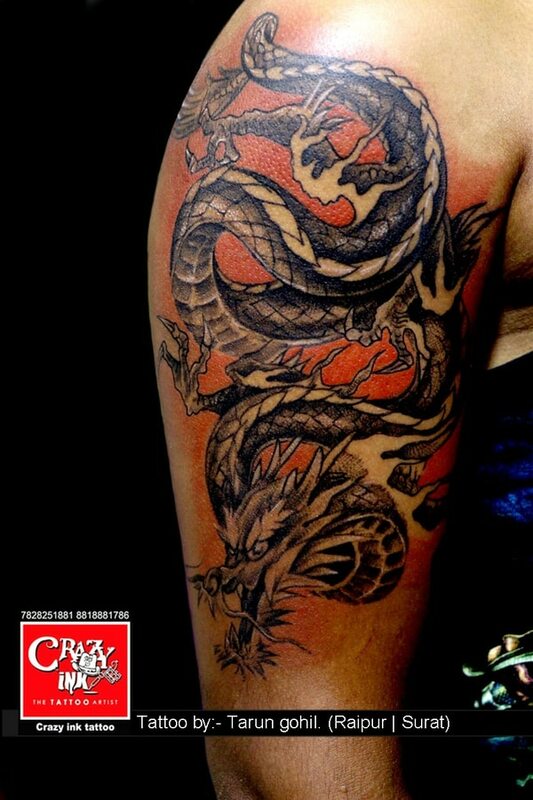 DRAGON TATTOO, ASIAN DRAGON TATTOO, CHINESE DRAGON TATTOO, JAPANESE DRAGON TATTOO, MEN TATTOO, TATTOO IDEA, SURAT TATTOO ARTIST, SURAT TATTOO STUDIO, SURAT TATTOO, RAIPUR TATTOO STUDIO, RAIPUR TATTOO ARTIST, RAIPUR TATTOO. GORGEOUS WINGS TATTOO ON NECK. 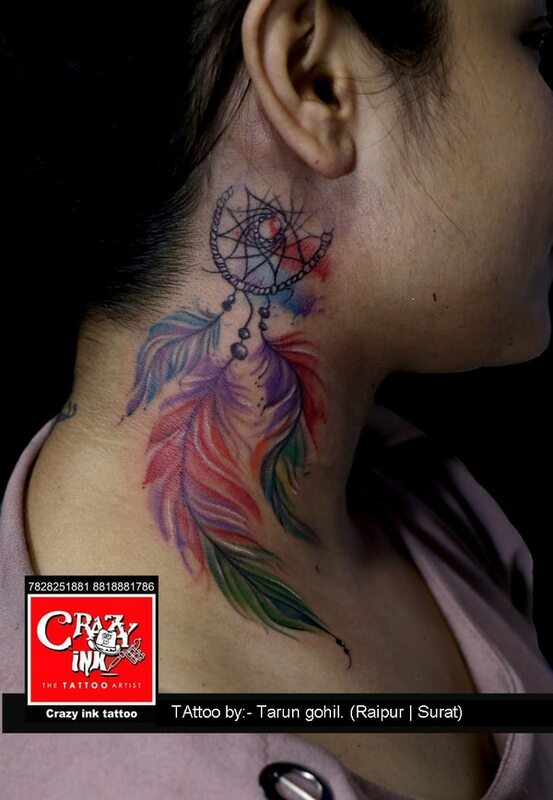 Wing tattoo designs often have inspirational or spiritual symbolism for the wearer. In many myths, for example, wings have to be earned. In nature, wings allow birds and insects to fly. Symbolically they can represent: Speed Elevation Freedom Aspiration These tattoos often appear on the back, since that is where wings are located on the creatures that have them. 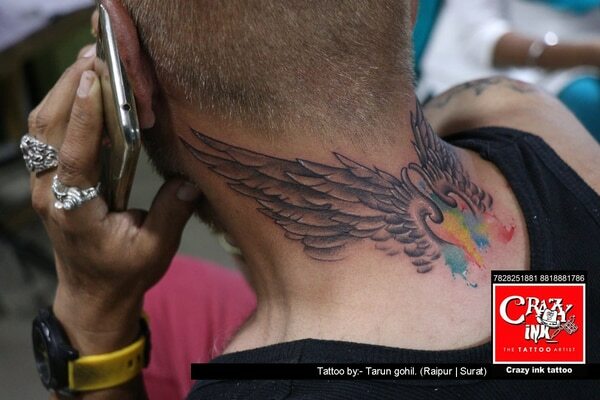 WINGS TATTOO, NECK WINGS TATTOO, ANGLE WINGS TATTOO, DEVIL WINGS TATTOO, COLOR TATTOO, TATTOO FOR MEN, TATTOO IDEA, RAIPUR TATTOO ARTIST, RIAPUR TATTOO, RAIPUR TATTOO STUDIO, SURAT TATTOO ARTIST, SURAT TATTOO, SURAT TATTOO STUDIO. 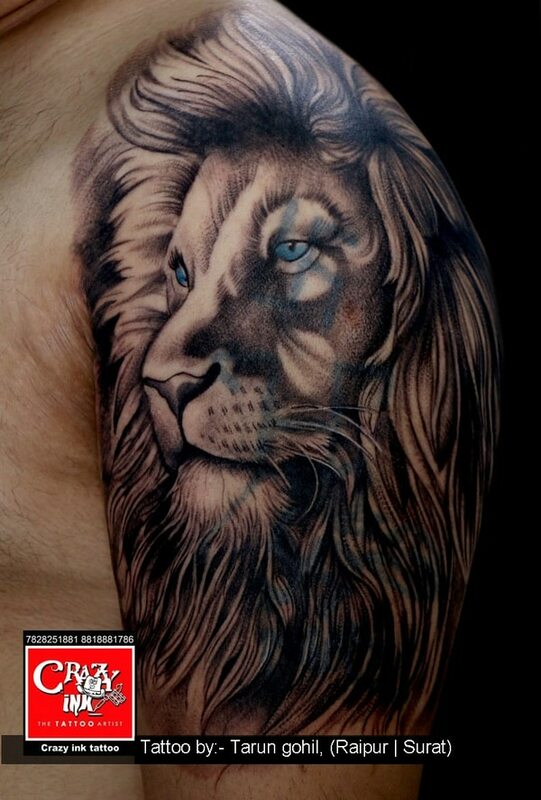 LION PORTRAIT TATTOO. Lion and Lioness Tattoos come in a variety of styles and forms. The images can be stylized, like those images often seen in Buddhist and Hindu art, or they may realistically represent the actual animal like many African and Western art pieces. You can add dimension to whichever style you choose by carefully considering where the tattoo will be placed. A tattoo on top of a major muscle group gives an illusion of movement with each twitch, thus making your roaring lion stand out. It is important to note that even though most of the article focuses on the meaning of Lion Tattoos, in general, both the Lion and the Lioness represent the same spiritual and moral traditions. Lioness Tattoos have the added advantage of being linked with Family, Femininity, and Motherhood. LION TATTOO, LIONESS TATTOO, LION PORTRAIT TATTOO, TATTOO IDEA, PORTRAIT TATTOO ARTIST, RIAPUR TATTOO ARTIST, RAIPUR TATTOO, RAIPUR TATTOO STUDIO, SURAT TATTOO ARTIST, SURAT TATTOO STUDIO, SURAT TATTOO, MEN TATTOO, SYMBOL OF POWER TATTOO. MAORI ARM BAND TATTOO. Maori band tattoos are very smart to look at and it looks even smarter when it is done to cover a portion of the forearms. This is one of the Maori tattoos for men and is a miscellaneous combination of a number of Maori symbols and signs such as Celtic signs and knots, the human symbol, parts of arrows and much more worked out in such a great way. The tattoo also has touches of red along with the normal black which makes it look very bright and another thing is that this tattoo does cover the whole arms. BAND TATTOO. 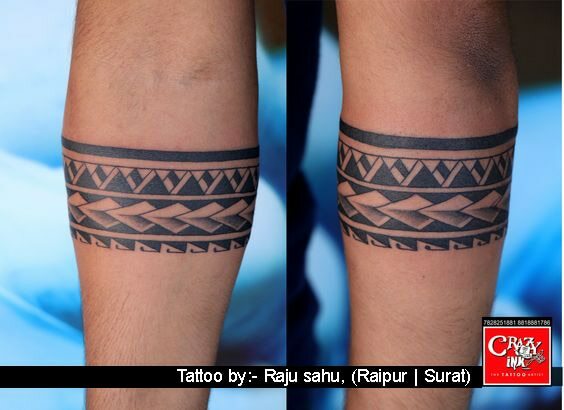 MAORI BAND TATTOO, ARM BAND TATTOO, MEN'S BAND TATTOO, MAORI TATTOO, ARMS TATTOO, FREEHAND BAND TATTOO, SURAT TATTOO ARTIST, SURAT TATTOO STUDIO, SURAT ARTIST, RAIPUR TATTOO ARTIST, RAIPUR TATTOO STUDIO, RAIPUR ARTIST. 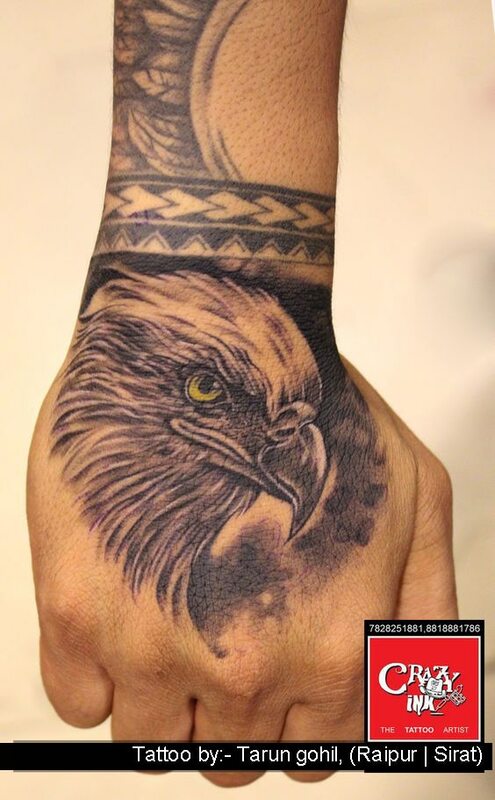 EAGLE HEAD TATTOO. This majestic bird has long been a symbol of Spirituality, Wisdom, and Power. While it is most commonly associated with the United States, the Eagle as a cultural representation has been around for thousands of years. From as far back as the days of ancient Greece, eagles have been seen as the embodiment of masculine Strength and Virility. The Greek god Zeus, known for his numerous trysts with mortal women, was often associated with the Eagle and the animal itself was usually depicted carrying the ultimate symbol of Zeus, a lightning bolt. Native Americans embraced this great bird as a symbol of spiritual power. Its ability to soar high above the mountains while bathed in brilliant sunlight made them 'the great Messenger of the Gods'. Native tribes on the plains believed that the Eagle was the earthly incarnation of the Thunderbird spirit, embodying thunder and lightning. 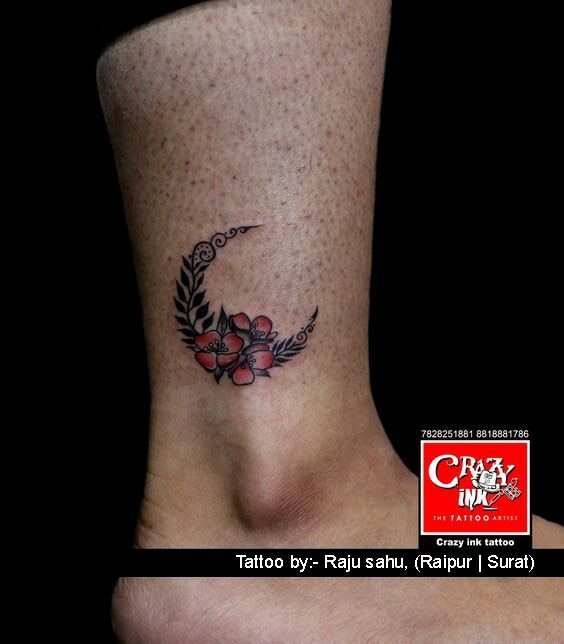 EAGLE TATTOO, EAGLE HEAD TATTOO, BIRD TATTOO, EAGLE EYE TATTOO, GODS BIRD, SURAT TATTOO #SURAT TATTOO ARTIST, SURAT TATTOO STUDIO, RAIPUR TATTOO, RAIPUR TATTOO STUDIO, RAIPUR TATTOO ARTIST. ANCHOR COMPASS TATTOO. Anchor Compass: since the anchor is common symbol of Christian faith, the anchor compass tattoo design represents religious guidance. Celtic Compass: a close relative to the Celtic trinity knot, the Celtic compass tattoo design shows pride in one’s ancestry. Heart Compass: this tattoo designs symbolizes a willingness to let your heart guide your actions in life. Map Compass: for those adventure seekers and explorers, the map compass tattoo design symbolizes a passion for travel and discovery. 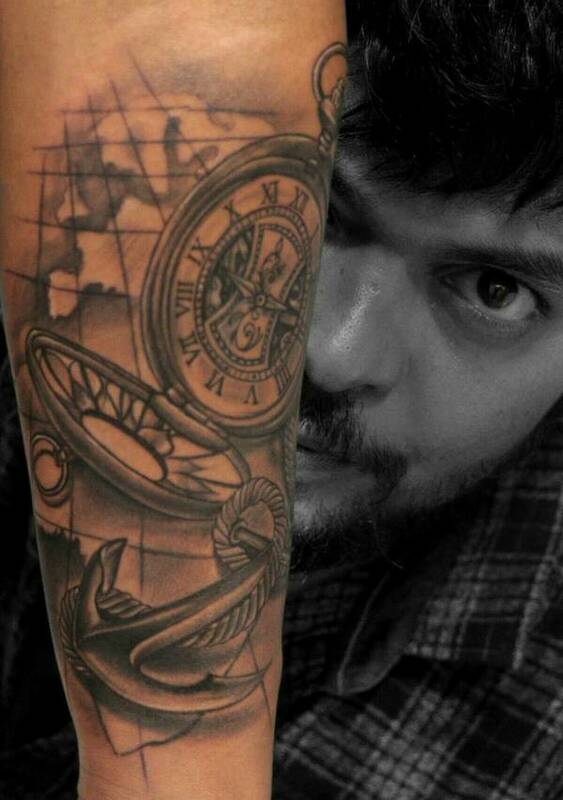 Nautical Compass: the nautical compass tattoo design represents peace and harmony. Rose Compass: a rose compass symbolizes a passion for romance and a search for love. Star Compass: the star compass tattoo design is based on the North Star, which sailors would use to orient themselves at sea. It represents those who are seeking guidance. Vintage Compass: the vintage compass tattoo design is suited for a lover of history. For those who have spent time in the Navy, it also represents protection. Representing anything from guidance and protection, to a search for your passions, compasses have a strong history of symbolism in many cultures and as tattoo designs. Whether you want to honour your heritage or you’re seeking direction in your life, a compass tattoo design can stand as an excellent choice. If you know of any other compelling compass tattoo designs, let us know about them in the comment section below! 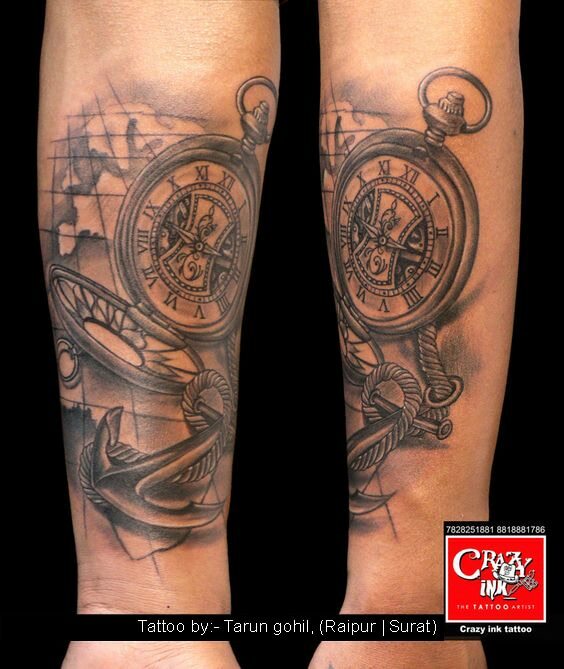 ANCHOR TATTOO, COMPASS TATTOO, MAP TATTOO, ROPE TATTOO, ARMS TATTOO, MEN TATTOO, SURAT TATTOO ARTIST, SURAT TATTOO STUDIO, RAIPUR TATTOO ARTIST, RAIPUR TATTOO STUDIO, INDIAN TATTOO ARTIST, INDIAN TATTOO STUDIO.